Once you know this is not a police cruiser with a radar gun, you might feel emboldened to lean your bike against it. Whether this works if speed control is the goal, I’m not sure. Yachats, on the central coast in Lincoln County, seems to think it’s worth a try. 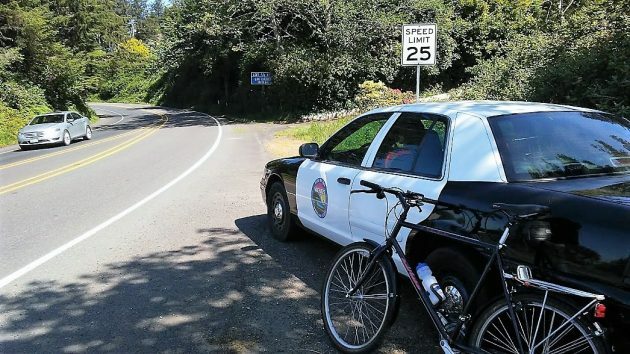 Without a police force of its own, the town has been parking an old Crown Victoria in strategic spots to try to slow traffic on Highway 101 to 25 miles an hour as it enters the business district. My guess is that tourists instinctively hit the brakes the first time they see the black-and-white. And even regulars on the highway might be reminded of the reduction in speed, more than by the sign alone. As a low-cost attempt, it beats installation of radar speed signs of the type that the Albany City Council wants the staff to install on Second Avenue near where the street crosses the Portland & Western track. Similar radar speed displays on Spring Hill in North Albany cost Benton County several thousands dollars when they were put up about two years ago. The Albany council gave its staff direction on April 23 to put up the Second Avenue radar speed display sign temporarily to see whether it works to slow traffic down. No word on how the planning for that project is coming, or when it might be carried out. This officer seems kind of passive, even when somebody points a phone camera at him. His lack of arms may have something to do with it. I hate to say it but it is like Law Enforcement can never win, if they set up random speed traps or pull anyone over for speeding then they are just a revenue for their jurisdiction. But if they don’t do anything then they are just lazy and no one has any respect for the law. I do have to say though that it is hard to take speed limits serious when 90% of the time Law Enforcement are doing at least 5 mph over in everyday driving. I fact the other night an officer popped on his lights to get a car that was probably doing 10 over to get over then when the Officer got past him just turned off his lights and cruised just a little faster then he was going. Remember the one that use to be ion Spring Hill Road? Used to be? Last time I looked it was still there. 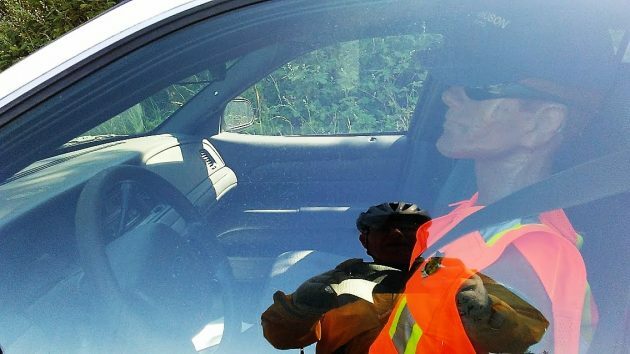 They used this tactic in Kanab, Utah, complete with a dummy in uniform in the driver’s seat. It was quite the roadside attraction! This is what some call the “HALO EFFECT”. It only acts as a reminder for a short time then it goes away. Drivers need to pay attention and heed the signs. The are intended for everyone. Saw an even lower cost painting of a police car on a wall in Sweet Home. Alternate it periodically with a real officer and let the ticket writing begin. Keep them guessing.